Last week I was away, traveling to North Carolina for the fabulous High Point Market. It was my second year attending Market, and this year was particularly exciting. I was sponsored by three incredible showrooms – Thomasville, Drexel Heritage, and Hickory Chair. 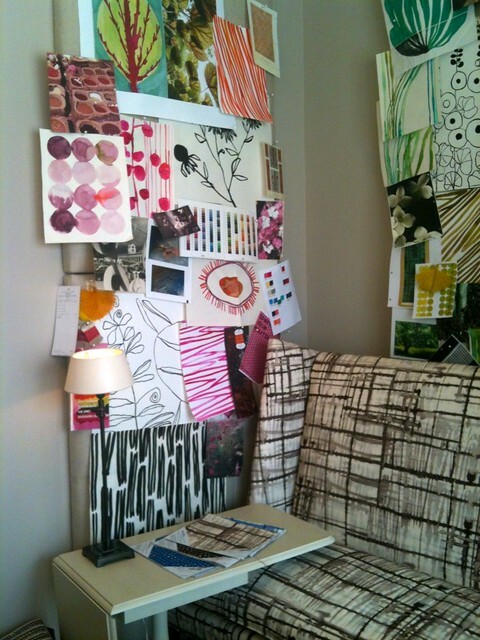 While touring the showrooms, I spotted some fantastic design trends for 2012 – more color, pattern, and global influences than I’ve ever seen before were present in each showroom. And the items with the most interesting designs were hands-down the side chairs. Offering bursts of bright color and bold patterns, side chairs were being treated as the must-have home accessory, bringing in interesting design and statement decor with just one piece. There was a unique Asian influence throughout the Thomasville showroom. Strong geometric patterns, and new takes on Chinese chinoiserie were present. 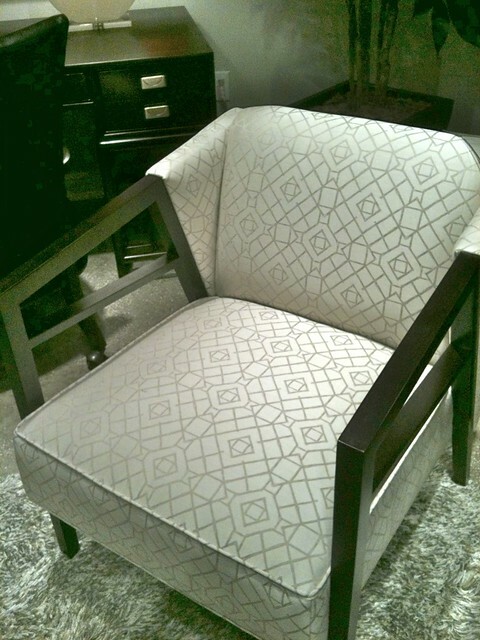 This stunning chair in a modern oriental pattern is a perfect example. 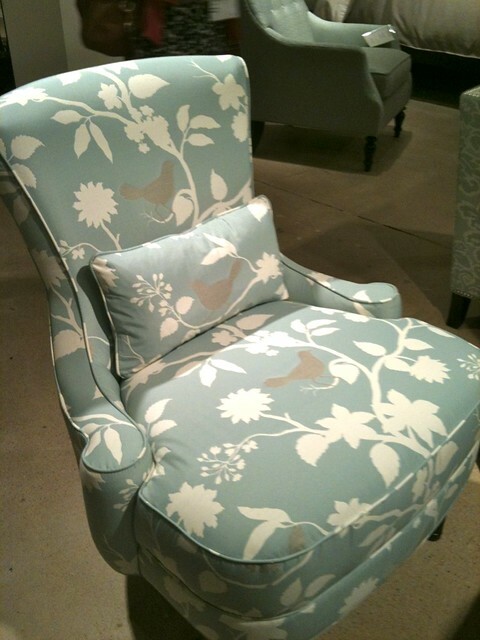 And this bold floral pattern is a new spin on chinoiserie with an oversized bloom and bird motif. 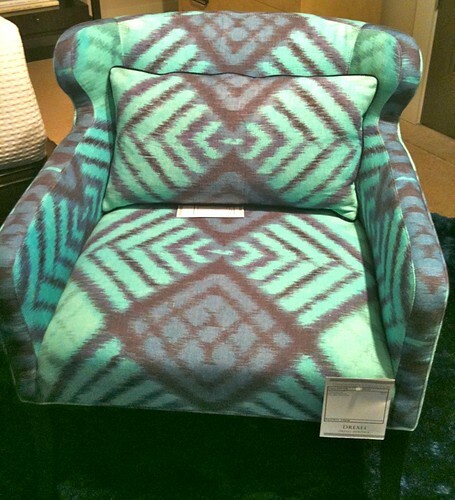 Suzanis took on a new form at High Point, as upholstery. 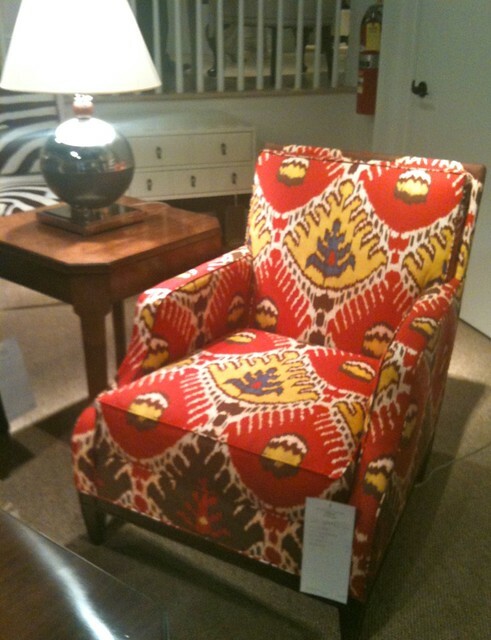 These chairs from Hickory Chair show how beautiful the suzani pattern can be in vivid shades of red and yellow. And I also love this more subtle design. It’s a beautiful color palette for a room with grays and blues. Cool zig-zags were everywhere. 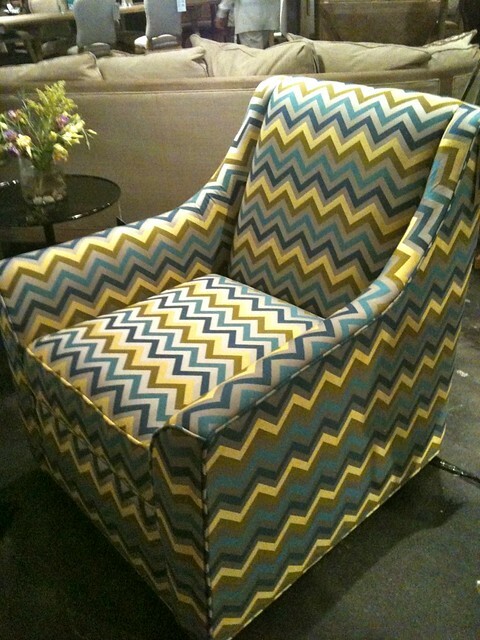 Chevron and flame stitch patterns were present on a number of very cool chairs. This one from Thomasville definitely stood out. 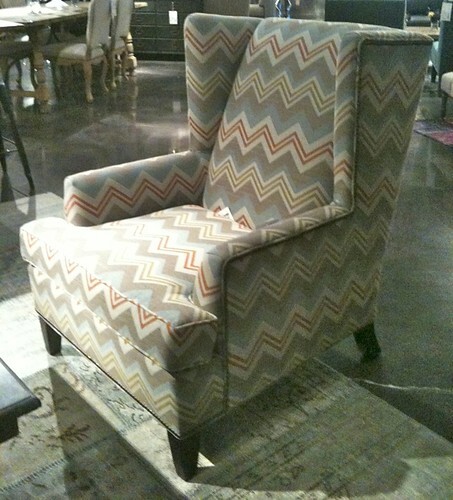 The colors are soft and neutral, making this chair all about the pattern. 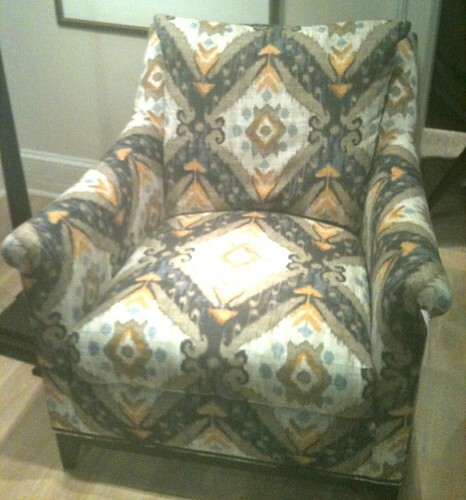 At the Four Hands showroom I spotted this colorful chair in tones of gray, blue, orange, and yellow. The classic shape becomes modern when upholstered in an unconventional pattern. 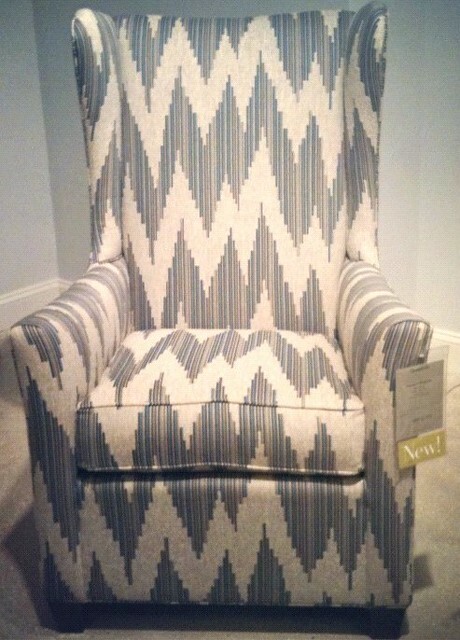 And I fell in love with another chevron chair from Four Hands. As I recall, this one swivels! Swiveling chairs were another trend at Market. Great for conversation areas in your living room. 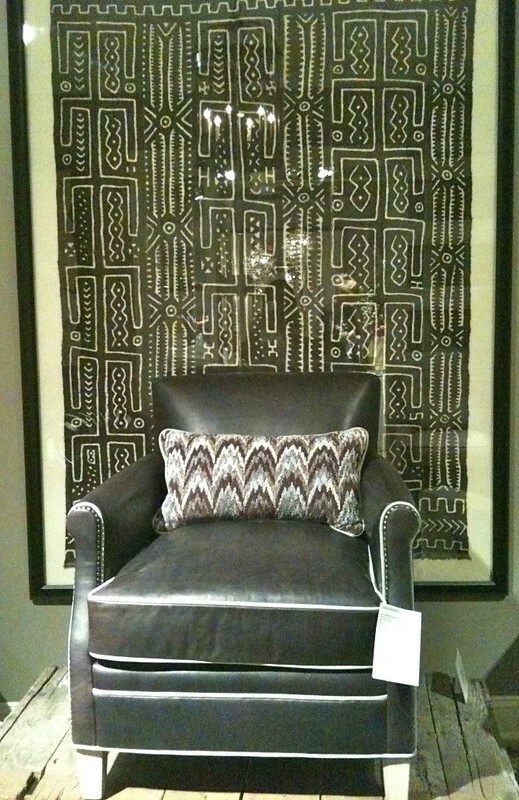 And while this chair from Drexel Heritage isn’t in a flame stitch pattern, I really like the idea of a flame stitch pillow on a cool black leather chair. It’s a great way to bring pattern into a room in a small dose. Hickory Chair and Brooklyn-based company, Hable Construction developed a collaboration leading to some unique chair designs. The designs are simply beautiful, inspired by watercolors and hand-drawn illustrations. The upholstery fabric looks as if it has been painted on. And I really love this fabric featuring loopy doodles. 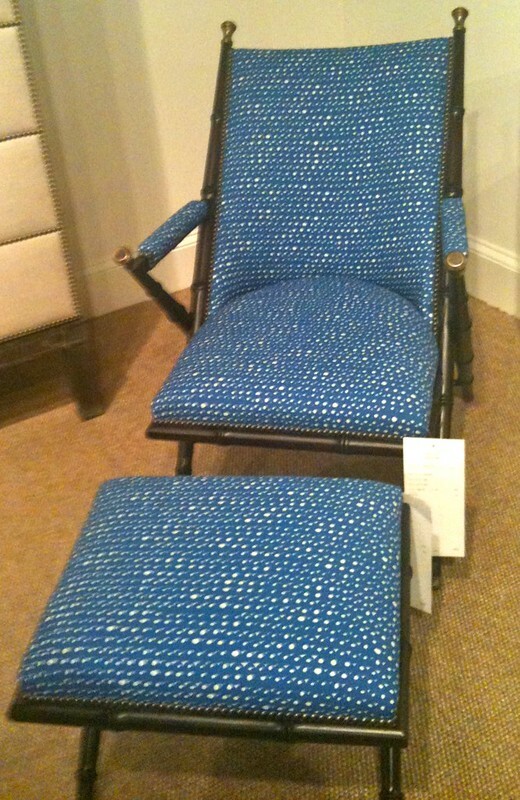 It’s fabulous on this old-school Indian cane chair. 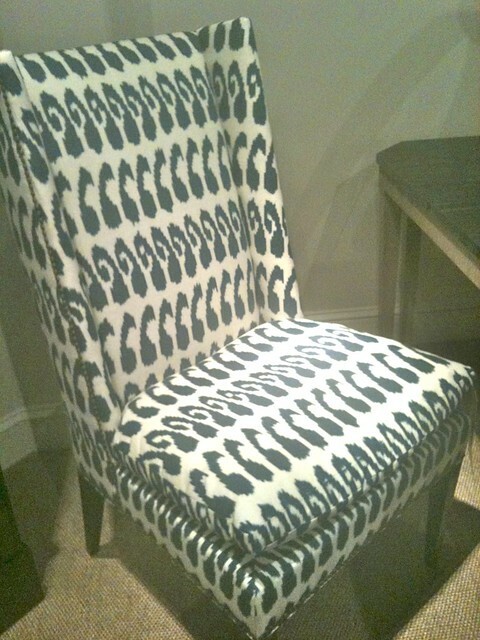 Ikat patterns where also present in new ways. 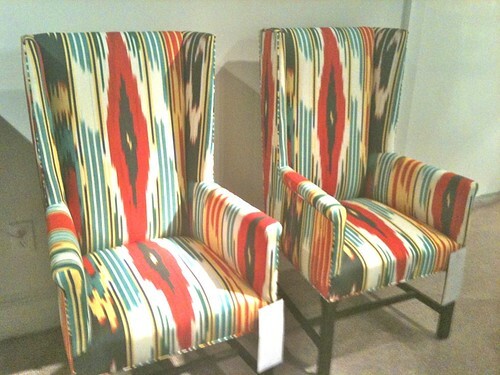 This ikat chair left me awe-struck, and I love the matching pillow for extra support. 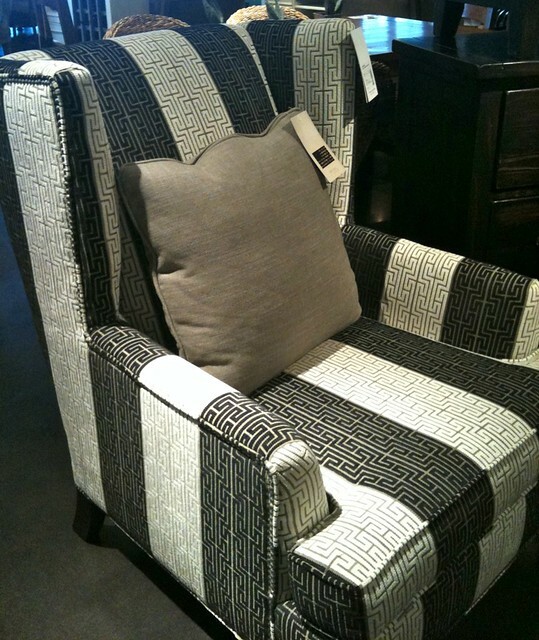 This black and white chair featuring a Greek key pattern was also a stunner. Completely classic and a great chair for a traditional living room. There were so many beautiful pieces to explore, and you can see more of what I loved tomorrow with Part II of my High Point coverage. See you soon!